Gizmo addiction. If you have it like I do you've already looked at the Garmin Oregon or Colorado series of GPS units - and learned from reviews they suffer from poor screen visibility in varying light conditions. Well, I'd read the Oregon visibility was improved, and the 500 models also had a camera - that was enough for me. I bought one 2 days before the CocoBob ride, uploaded the route track and set off for AZ. But all is not lost. Based on a review of the Dakota series (same touchscreen interface) and my experiences with the unit in AZ, a change of system settings and a custom mount have made it much more readable. In fact, I think it's as good as the vista series now - but I'll have to save that observation for the next race. Here's what the screen looks like under factory settings. 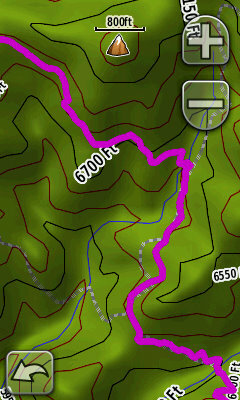 3. set map detail to "less". The difference is shocking - and legible in the field without having the backlight turned on. It's simple - a 1" aluminum pipe cut in half lengthwise with the mount attached via zip ties to the upper half. Grooves for the bars are dremeled into each half, and the whole assembly is attached to the bars with 4 broccoli bunch rubber bands. This enables the GPS to be rotated in any direction and get the light angle right where you need it. We field tested it yesterday in the most challenging type of light: high clouds, sun low in sky, in and out of trees, and with these settings and mount it's something I'd be comfortable racing with. So there it is. A usable Oregon setup. Now I can make use of all those advanced bells and whistles on this unit: large screen, camera, heart rate, and a sweet touchscreen interface. Gotta love gizmo unification. 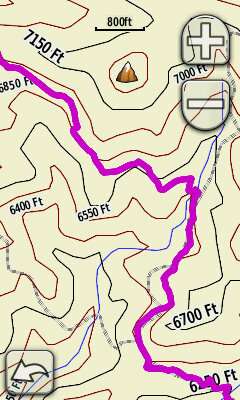 BTW, those map shots above are of the South Boundary trail in Dixie National Forest SW of Enterprise. It's out there! It's very near where these shots were taken. Those shots are geotagged (taken with the Oregon), click here to see the map. Here's a shot of those peaks from afar in April. Seasonal differences are huge!